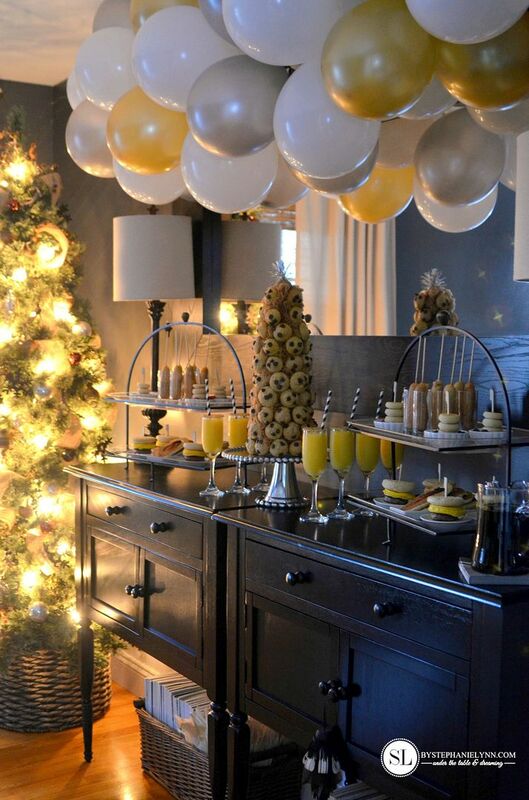 It’s that time of year again to start planning our holiday parties and get togethers. There are so many special people in our lives that we love to celebrate the season with – though so little time. The four weekends between Thanksgiving and Christmas seem to fly by so quickly. Traditionally, I’ve always hosted evening get togethers, though this year I am entertaining the idea of a holiday brunch. 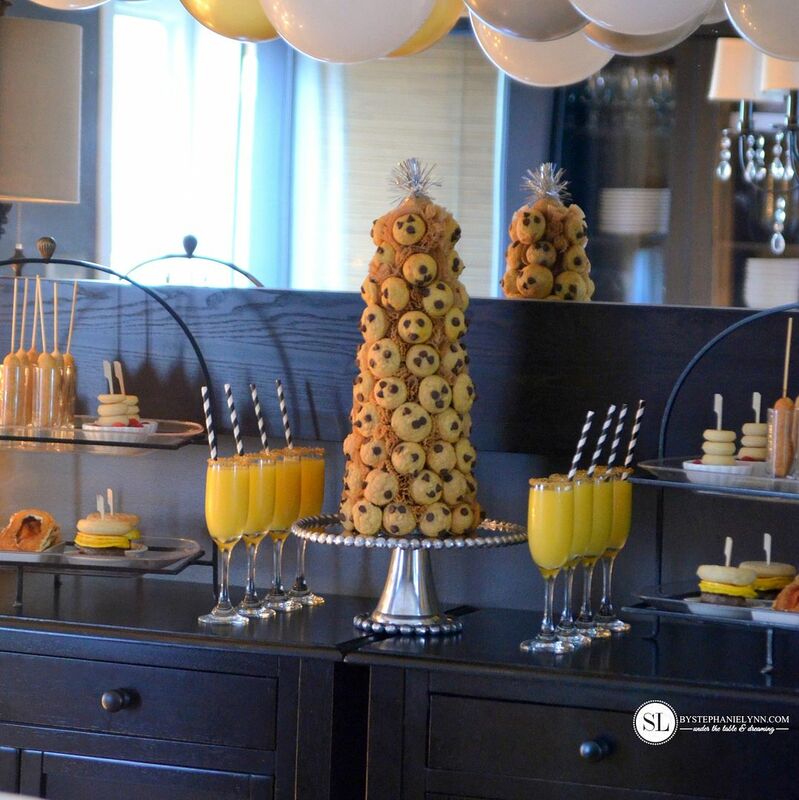 I like the idea of a brunch because it is served early in the day and opens up a chance for entertaining, when typical party schedules can be a bit hectic. Plus it gives us a reason to change things up and serve some comforting breakfast food! 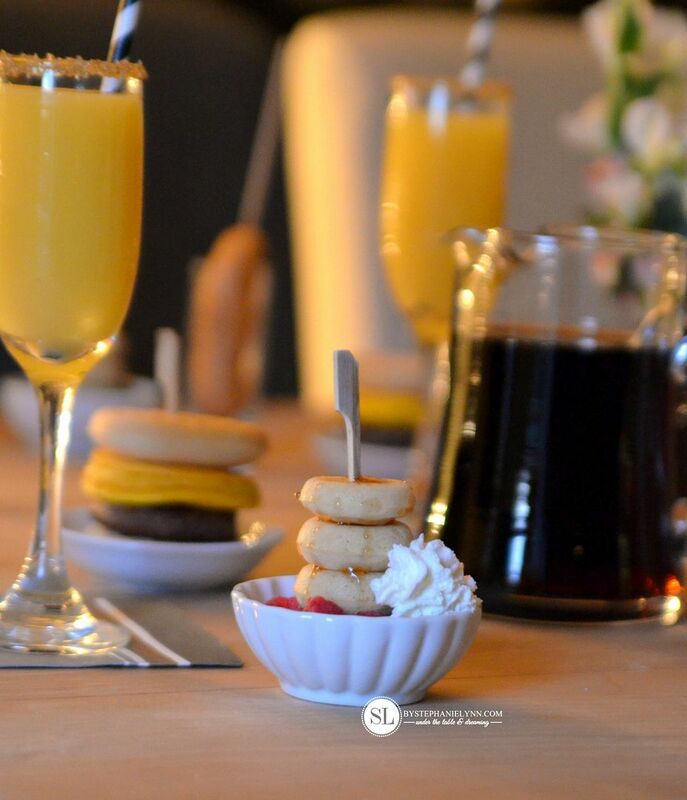 For this inspirational brunch I choose to put together a pancake bar party. It’s quite simple to get creative in the kitchen with delicious pancakes. The plans for the pancake bar incorporate five simple recipes, which are shared below. All but one of the recipes are baked in the oven which cuts down on the host’s workload and enables us to spend more time with our guests. 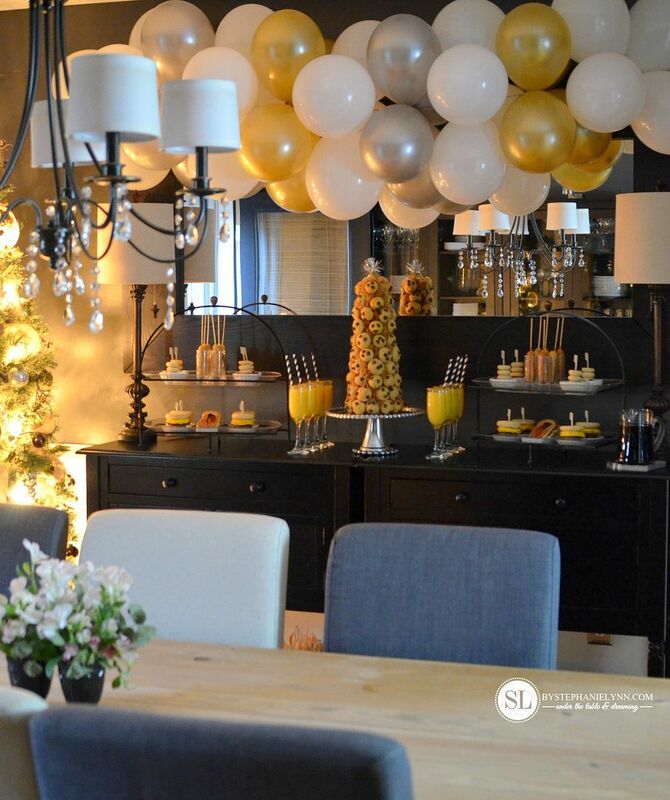 Whether you are hosting a holiday brunch of your own, or simply making Christmas morning breakfast for your family, I hope you’ll be inspired to celebrate the special moments of the season – around the table with your loved ones. 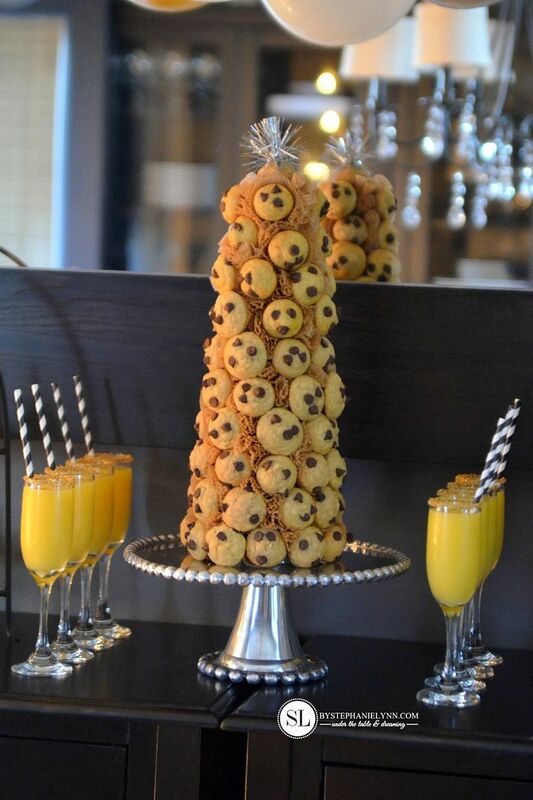 The star of the show, and centerpiece of the bar, is this Mini Pancake Muffin Tower. The mini muffins take the deliciousness of a traditional pancake and bundle it up into a fun bite size muffin. Although they can be customized with a variety toppings, we choose to toss in some chocolate chips for a sweet addition to bar – and serve them with a side of warm syrup. 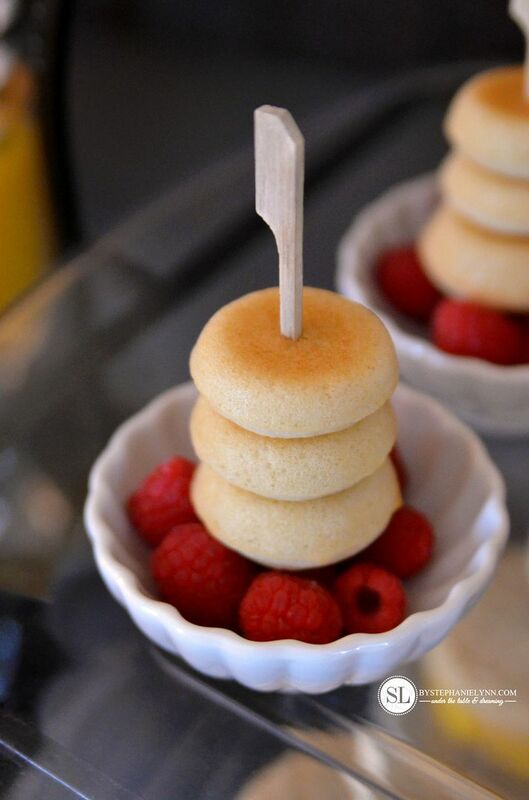 The mini pancake stacks are baked in the oven and can be served a variety of ways. We laid our stacks on a bed of fresh raspberries and blueberries with a side of warm syrup and whipped cream. 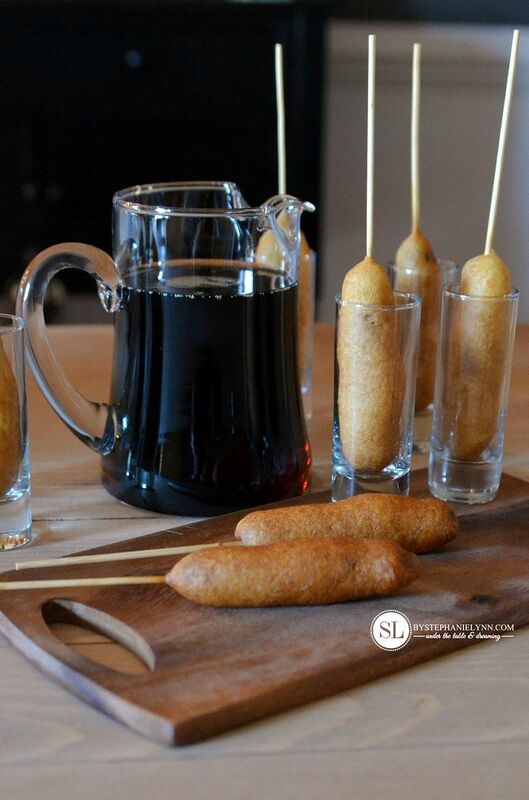 Food served on a stick is always a fun option and these sausage pancakes do not disappoint. The outside pancake is fried golden brown, and a delicious, all in one take on the traditional breakfast favorites. 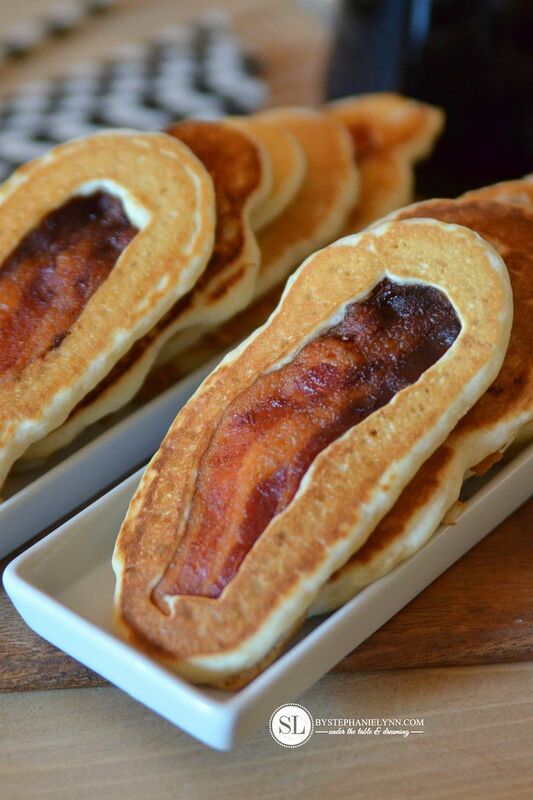 And finally, the biggest why didn’t I think of this before dish – bacon strip pancakes. Yes, a strip of bacon nestled right in a warm buttermilk pancake. 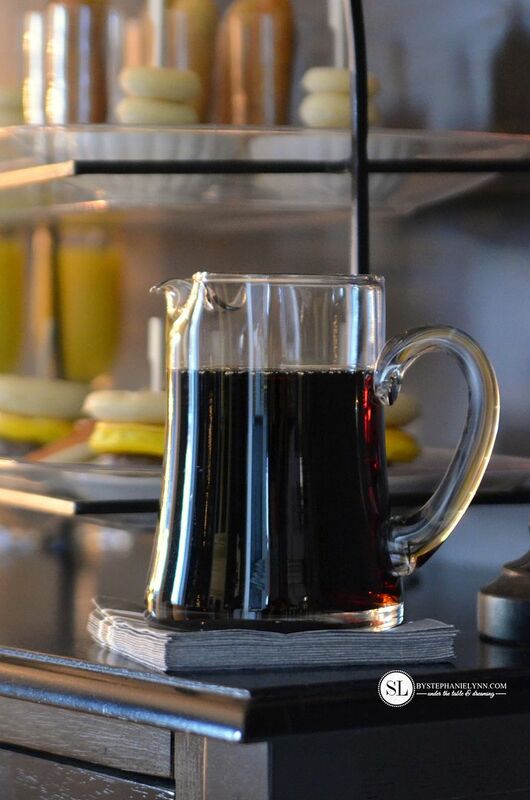 A carafe of warm syrup to compliment all of the fluffy goodness. 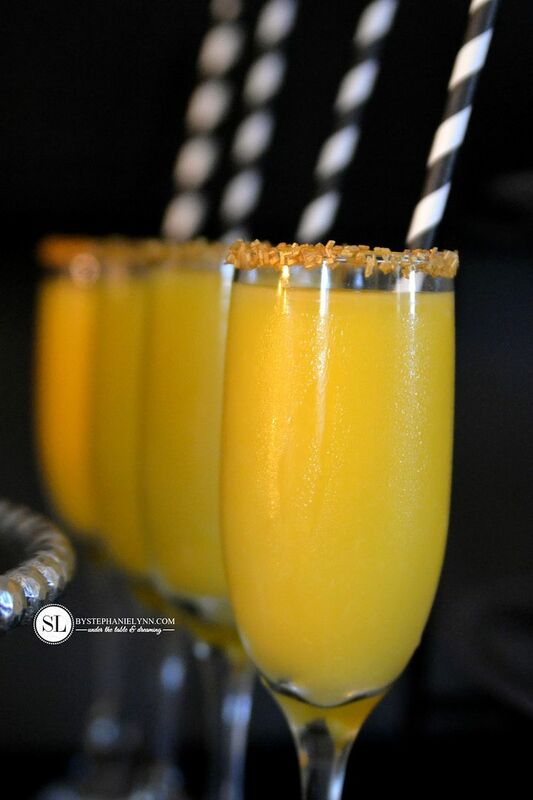 Since every occasion is a special occasion, we fancied up the orange juice by serving it in some sugar rimmed glasses. Breakfast (or brunch) is served. 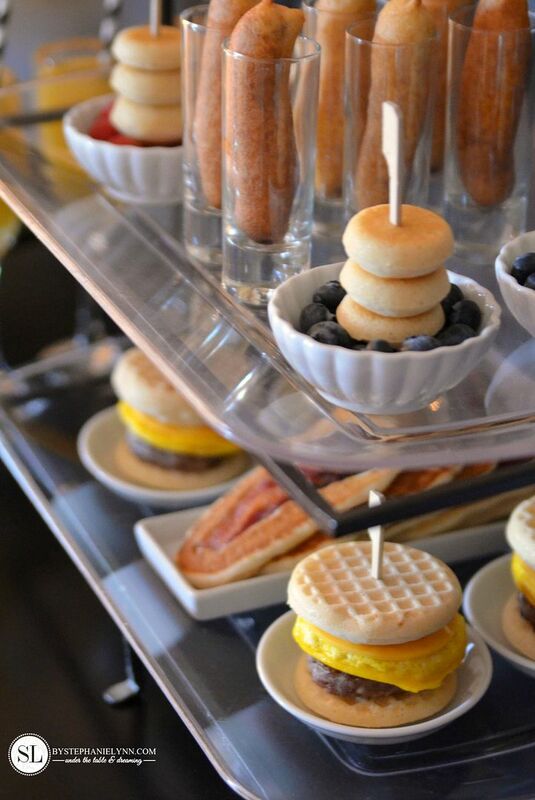 Find all of the recipes for this Pancake Bar Party below. 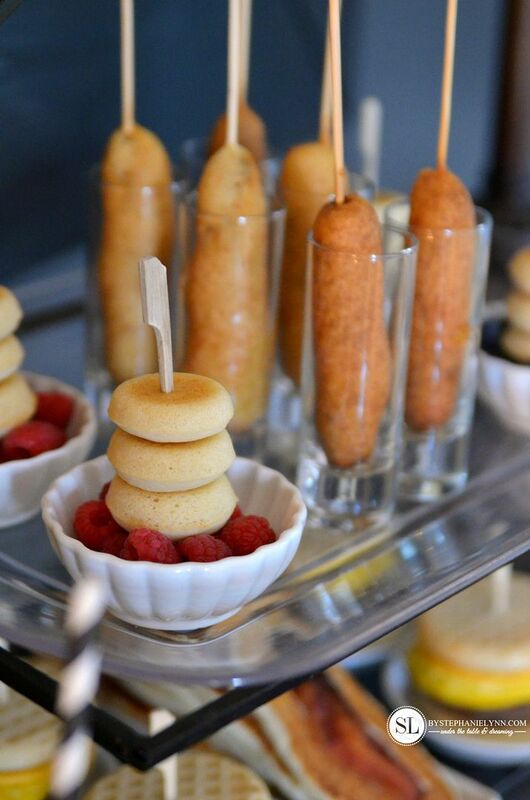 These mini stakes are the perfect compliment for a pancake bar as they can be served with a variety of toppings. To get a uniformed shape we used this Mini Cavity Wilton Pan . Baking the batter in the oven produces a large batch of flawless pancakes without much work. Prepare the baking pan by lightly spraying with a non-stick spray. Combine the pancake mix with water and stir until large lumps disappear. Do not beat or over-mix. Let stand 1-2 minutes to thicken. Scoop the batter into the Mini Wilton Pan, filling each cavity ¾'s of the way full. 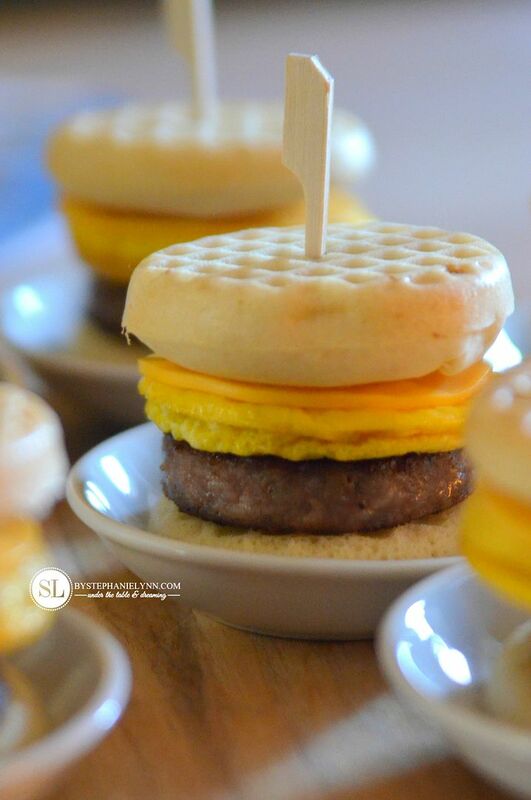 These sliders are a little twist on the traditional breakfast sandwich. Eggs, cheese and sausage patties are sandwiched between two baked pancakes. The pancakes and eggs are both baked in the oven using this Wilton Round Cavity Pan – producing a perfectly cooked, uniformed sandwich. Prepare the baking pans by lightly spraying with a non-stick spray. Cook the sausage patties on the stovetop, drain, and set aside. Cut cheese slices with a round cookie cutter and set aside. Combine pancake mix with water and stir until large lumps disappear. Do not beat or over-mix. Let stand 1-2 minutes to thicken. Scoop the batter into the Wilton Sandwich Pan, filling each cavity ¾'s of the way full. You will need 2 pancakes for each sandwich slider. Bake 8-10 minutes, or until the edges begin to brown. Whisk together the eggs and water. Add salt and pepper, as desired. Pour the eggs into the Wilton Sandwich Pan, evenly dispersing the eggs into six separate cavities. Bake for 10- 15 minutes, or until the eggs are set. 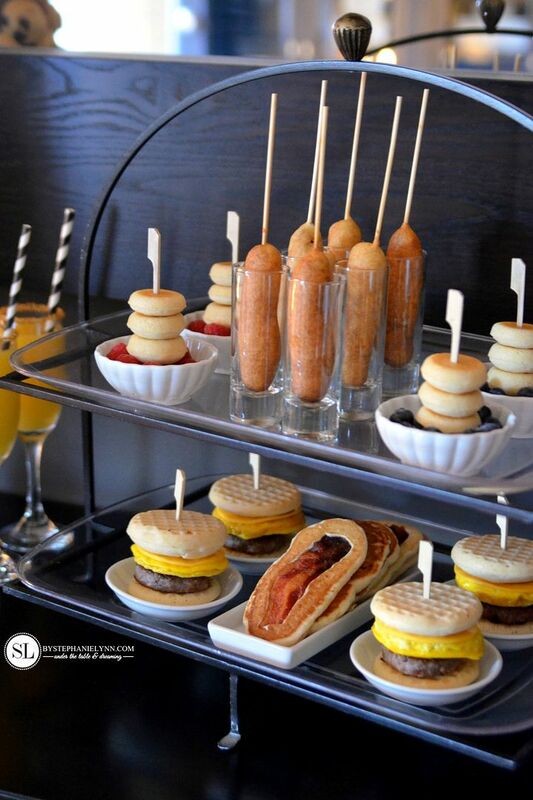 A fun and convenient way to serve pancakes and sausage is to serve them together on a stick. These are quite easy to make and take just a few minutes to prepare. Prepare the sausage links on the stovetop, according to the packaged directions. Drain and set aside. Heat the vegetable oil in a heavy bottom pot over medium-high heat, to 350°. In a large bowl, combine the pancake mix and water. Do not beat or over-mix. Let stand 1-2 minutes to thicken. Transfer the pancake batter into a tall glass for dipping. Insert a wooden skewer into each sausage link and roll in flour. Dip the sausages into the pancake batter and allow any excess drip off. Carefully place in the heated oil. After about a minute of cooking the skewer should float to the top of the oil. Turn to ensure even browning. Cook an additional 1-2 minutes, until the outside is golden brown. Bacon lovers will think this is one of the greatest pancake combinations ever! This genius idea was taken from a 1962 Aunt Jemima magazine ad and could not be any simpler to prepare. This Batter Dispenser makes the whole process ten times easier, without any mess. Cook the bacon as directed, per the package instructions. Combine the pancake mix and water in the batter dispenser. Stir until any large lumps disappear. Do not beat or over-mix. Lightly grease a non-stick skillet and place over a medium-high heat. Lay a slice of cooked bacon in the skillet and slowly cover with batter. We like to outline the bacon first, then fill in the center, ensuring the entire slice is covered. Once the pancake bubbles and the bottom turns golden brown, flip and cook the other side. 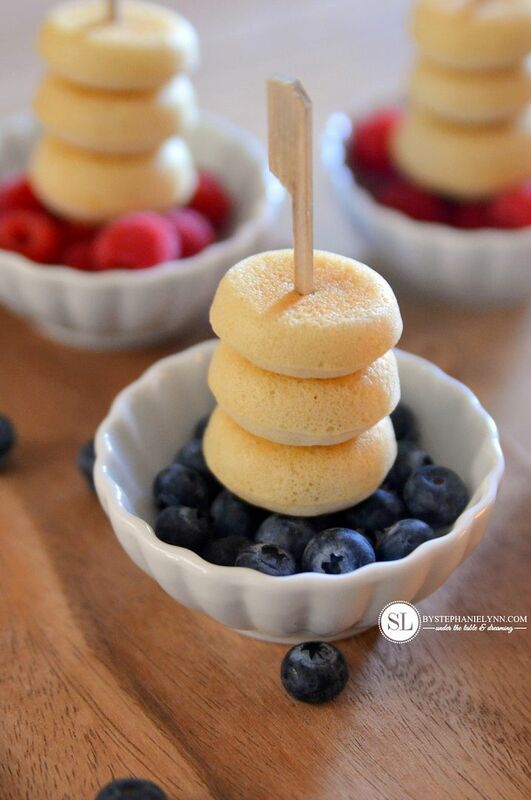 Enjoy the deliciousness of pancake without having to stand over the stovetop with these fun mini pancake muffins. The bite size gems can be customized with an array of add-ins and are best served with a side of warm syrup. 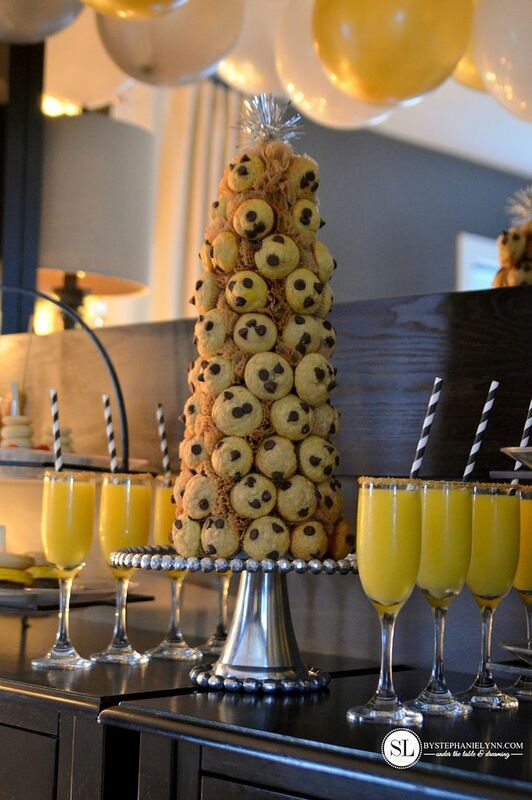 We turned our mini muffins into the centerpiece of the party by creating a muffin tower centerpiece display. The details and simple how-to can be found below. Line a mini muffin pan with paper liners or spray with a non-stick cooking spray. In a large bowl, combine the pancake mix and cinnamon. Set aside. In a separate bowl, combine the milk, honey, egg, oil, vanilla and whisk together. Add the wet mixture to the dry mixture and gently stir, until the dry ingredients are moistened. Fill each muffin cavity ¾'s of the way full. If using a topping, add to the top of each muffin. Bake 8-10 minutes, or until a toothpick inserted into the center comes out clean. Cool in the pan for 2 minutes, then remove. We used a 15 inch cone for our base and needed approximately 90 mini muffins (2 1/2 batches using the recipe above). The mini muffins were baked using this pan along with mini baking cups . The baking cups were used to keep the mini pancake muffins from coming in direct contact with the styrofoam. The styrofoam cone can be wrapped with decorative paper as well. 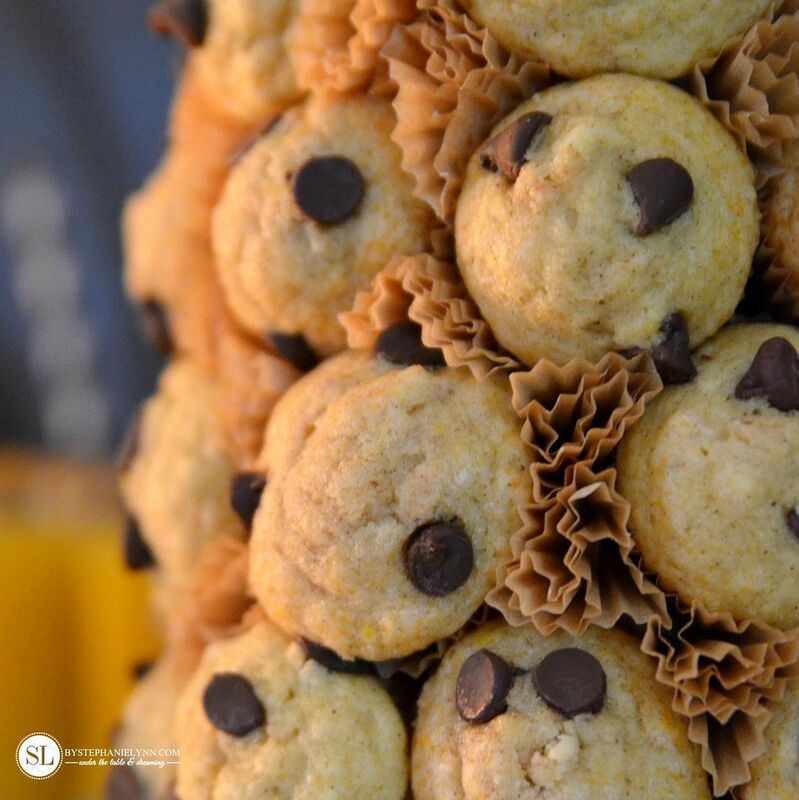 We didn’t wrap the cone for this tutorial, however, if you are serving these during a party, the decorative paper leaves a nice background for the guests to see once the muffins are removed. 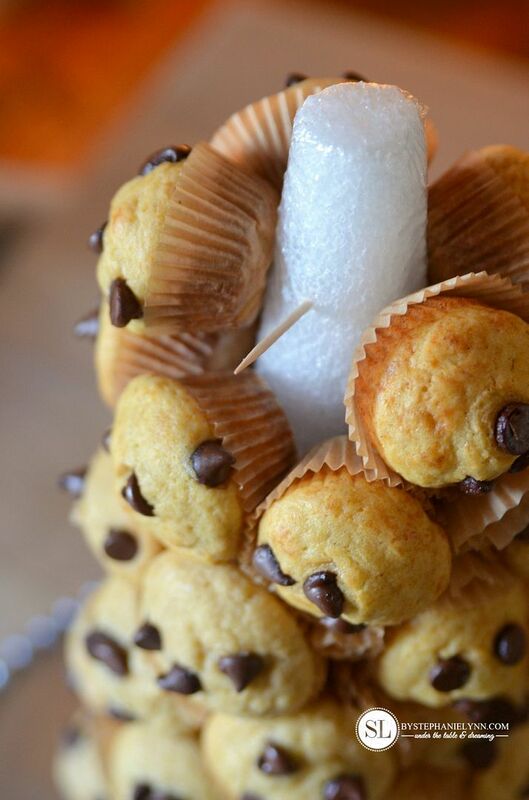 Before you start placing the muffins, it is a good idea to dedicate one side of the cone as the front. Each row of muffins will not finish perfectly, so the end of the rows should be facing the back of the cone. Starting at the bottom of the cone, insert a toothpick into the styrofoam and then place a muffin. If your muffins are freshly baked, they most likely will be really soft. To prevent smashing the muffin, it is a good idea to create a ‘starter hole’ – by sticking a toothpick in the bottom of the muffin , through the liner, and removing it – prior to placing the muffin on the cone. 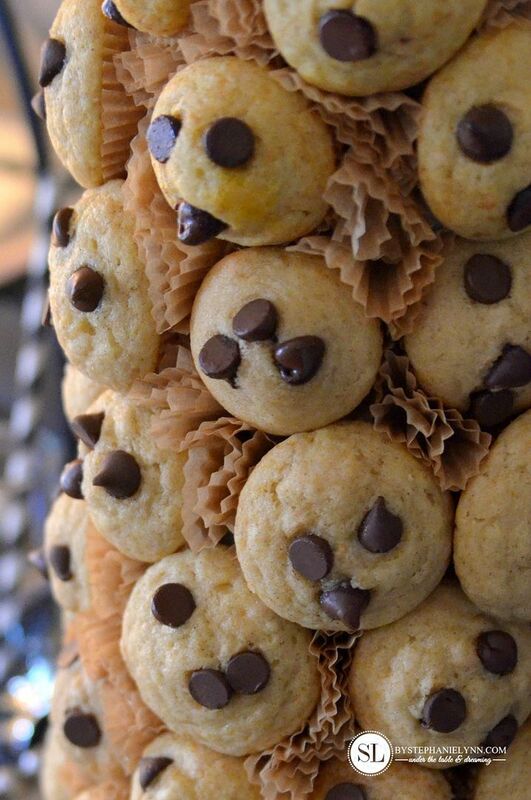 Continue placing the muffins around the cone, spacing each new row between the row below. Once the muffins are placed, go back and fill in any empty spaces by tucking in folded cupcake liners. All of the ingredients for this Pancake Bar Party were conveniently picked up right at our local Walmart. Aunt Jemima Buttermilk Complete and Aunt Jemima Original Complete Pancake & Waffle Mix were used in all of the recipes above, served with warmed Aunt Jemima Original Syrup. 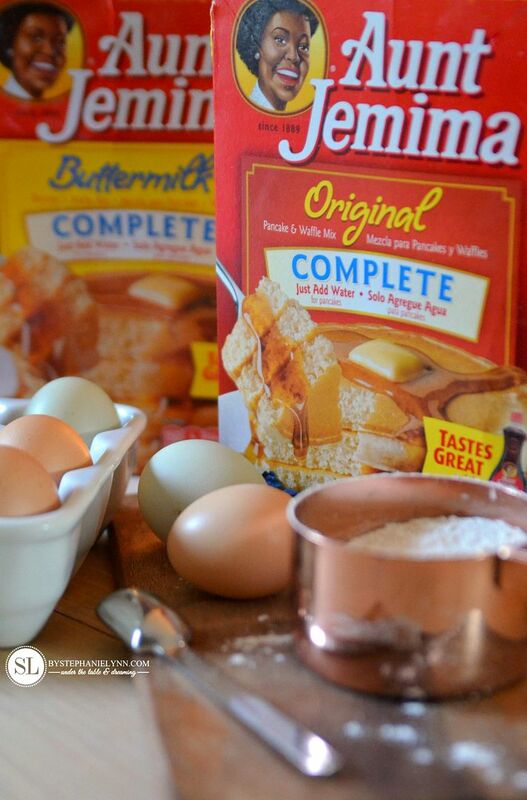 For more creative ways to celebrate the holidays, be sure to check out all of the recipes from the 12 days of Pancakes at Aunt Jemima – I’d love to hear your favorite! Genius! And perfect for kids. My family would even love this for dinner!! 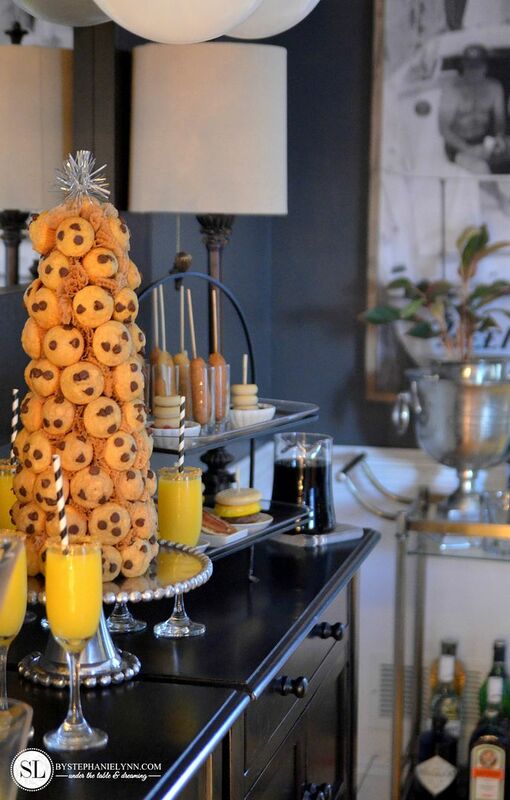 What a beautiful brunch idea for the holidays! Thank you! This is such a great idea. My department at work is doing Christmas brunch this year and I want to do this. Thanks so much for the inspiration! WOW!! 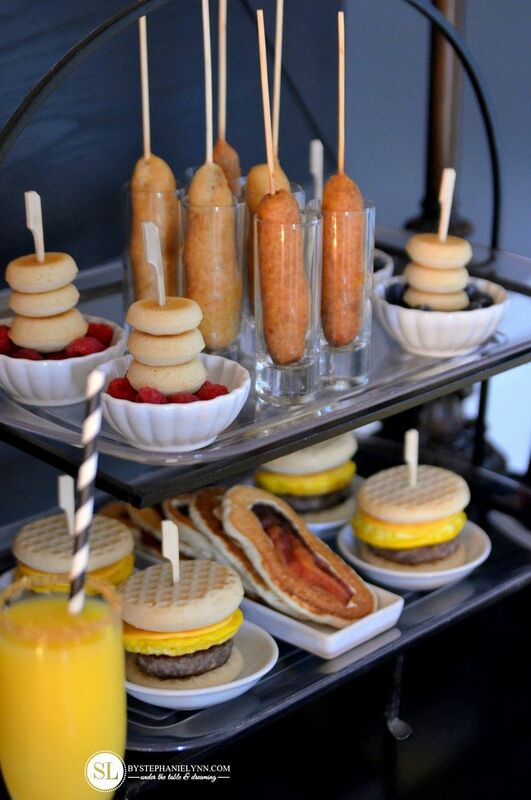 This is the most amazing brunch spread I have seen. Great job and beautiful photos.